Why are the animals at the centre? Were the animals’ victims of abuse? What are the animal rights in Thailand? These are just some of the questions that we are often asked by volunteers who are looking to join the Wildlife Rescue project in Thailand! The centre rescues animals from places where they have been mistreated or experienced neglect, and either seeks to re-release the animals or ensure that they spend the rest of their lives in a sanctuary as close to the natural environment as possible. In particular, it provides a permanent home for life for those animals that no-one else is prepared to care for e.g. the sick and disabled. The centre has a small animal wildlife hospital on site, supported by a full time vet to treat new arrivals and manage the ongoing care of animals on site – many of whom have long term health issues as a result of previous abuse and/or neglect. There are currently around 500 animals in the ‘Wildlife Rescue’ part of the centre including monkeys, bears and a variety of small mammals, birds and reptiles. Most primates in Thailand are classified under Appendix One in the Convention for International Trade of Endangered Species (CITES) and it has been illegal to acquire a wild animal for a pet in Thailand since 1992, yet regretfully, this practice still continues today. Fortunately some of these rescued primates are given to the centre and some are able to go through rehabilitation and return to the forest where they belong. 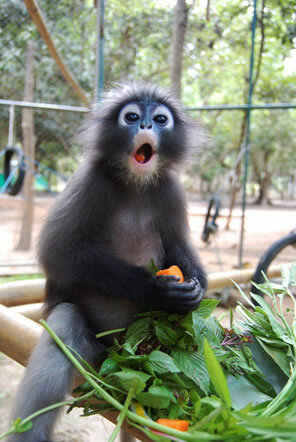 The centre houses a variety of species including macaques, gibbons, dusky langurs and slow lorises. A number of these are popular as ‘photo props’ in tourist areas and the centre actively campaigns against this practice, encouraging people to report sightings. 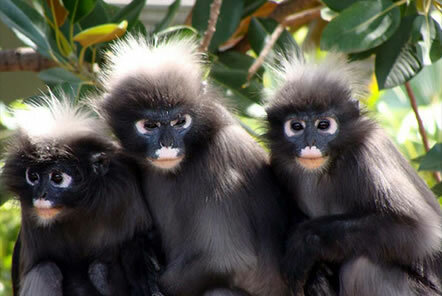 One particularly successful programme at the centre has been the gibbon rehabilitation and release project including the onsite ‘Gibbon Islands’. Rehabilitation involves putting healthy captive gibbons into a series of environments, which promote the physical health, and natural behaviour that is necessary for survival in the wild. This is done in three phases, starting with in-cage rehabilitation, then a support-fed island release and a final acclimatisation period in conjunction with release in the rainforest. This project involves the employment of local people who act as educators and 'gibbon guardians'. 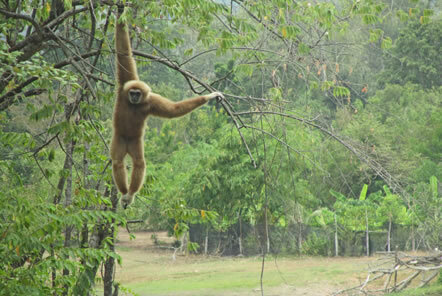 Sadly not all gibbons are suitable for rehabilitation and release. The years away from the forest in abnormal conditions reduces their physical and social abilities to the point where they can no longer adapt to life in the wild. These gibbons live comfortably at the centre. 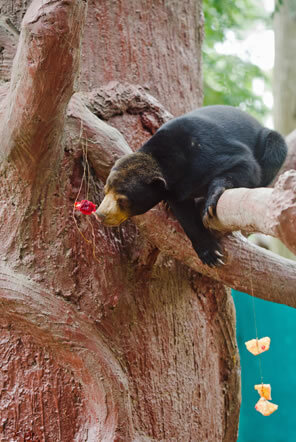 There are currently around 25 bears living at the centre, a mix of Malayan sun bears and Asiatic black bears (moon bears). Although in the wild they prefer a solitary life, the centre has been able to integrate them into small groups; each group enjoys a large enclosure with climbing opportunities and enrichments provided by volunteers – particularly anything with honey! They are intelligent and you will find each bear has a distinct personality. Primates and bears as well as many other small mammals are often taken in their infancy to be pets. Young monkeys are very affectionate, intelligent, and acrobatic and have that eerie human-like quality when young. 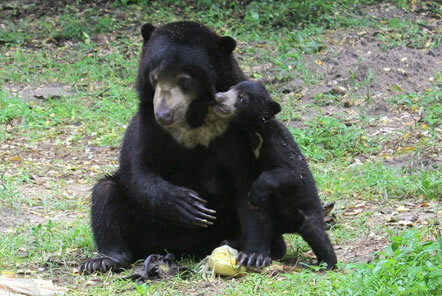 Similarly young sun and moon bears have the appeal of being a ‘real-life cuddly bear’. Acquiring a pet infant involves hunting a mother and infant and usually killing the mother in order to obtain the lucrative young monkey or bear. Only one in every three infant primates manages to survive this ordeal. Key targets for this practice are monkeys such as macaques, gibbons and slow lorises, both sun bears and moon bears and other small mammals. Wild animals kept as pets are commonly on a sub-standard diet without enough space to move and exercise and deprived of the company of other individuals of the same species. Bears quickly become aggressive as they grow and monkeys develop large canines and become unpredictable and aggressive. The once-loveable pet then becomes a dangerous wild animal and cannot be controlled, so is no longer wanted and is cruelly restricted with chains or small cages. Some are abandoned or given to the Thai authorities whose sanctuaries have limited housing. 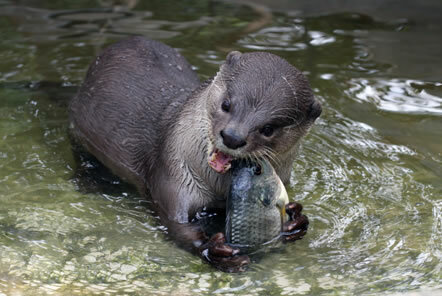 A number of animals are also targeted due to superstitions around their ‘healing powers’. In particular within Asia ‘bear bile faming’ and ‘bear paw soup’ are both believed to have healing properties in traditional Chinese medicine and there are a number of inhumane practices that can take place in relation to this. The lucrative nature of this black market trade means that it continues despite the fact it is mostly illegal across Asia. Animal rights in Thailand are a relatively new concept and many people do not understand that animals may also feel things such as pain and fear. Whilst travelling in Thailand you may be confronted with shocking situations and see wild animals kept in captivity; such as a gibbon used as a ‘photo prop’ or an eagle in a cage no bigger than itself. Attitudes towards animal welfare and conservation are slowly changing and people are becoming more conscious of the importance of nature preservation, largely helped by NGO projects such as the Wildlife Rescue centre. Please be prepared for difficult situations and hold back if they occur; you are a guest in the country and animal welfare foundations are lobbying for procedures in order to do something about this abuse.